Contrary to popular media outlets, cannabis edibles are now legal in Canada, as of October 17, 2018. A popular the GrowthOp Article published earlier this year suggests cannabis infused edibles in Canada are illegal, and that’s a little off. We wanted to share a little bit of Canadian regulation that might have gone overlooked in recent months. Cannabis edibles are legal in Canada. You read that correct, cannabis edibles are in-fact legal in Canada. That is, cannabis infused cooking, containing THC, and or CBD. In Canada, cannabis edibles are legal to make (absent of organic solvents) and consume. Although the Canadian Government has been a little behind in releasing regulations, Health Canada has asked for your input on the edibles frame work. You can add your input here through February 20, 2019. 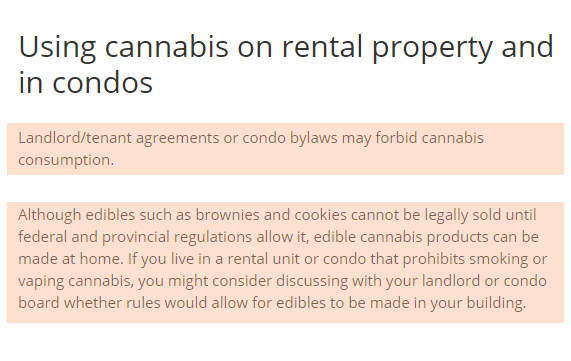 The City of Calgary website outlines Calgary’s local cannabis policy’s and on site consumption alternatives for cannabis users within rental properties.